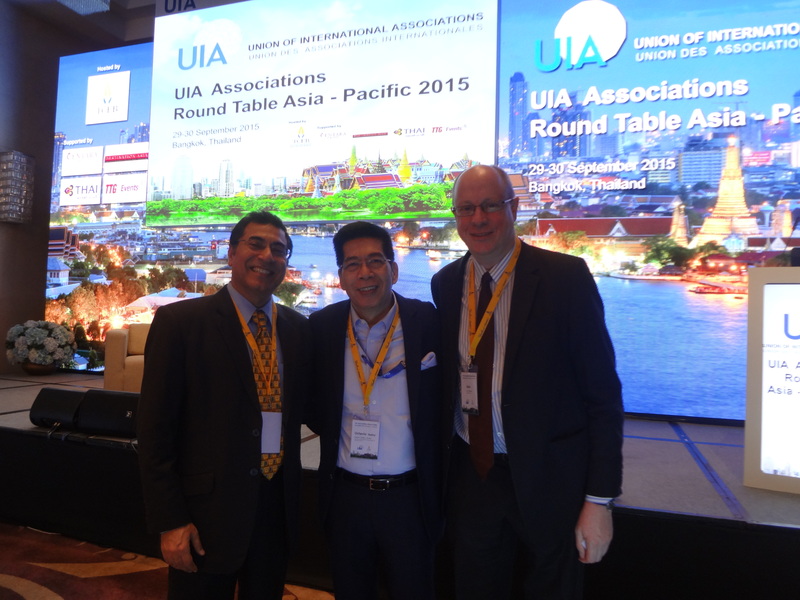 On invitation by the Brussels-based Union of International Associations (UIA), PCAAE, represented by its President & CEO, Mr. Octavio B. Peralta, participated in the UIA Associations Roundtable Asia-Pacific 2015 held at the Centara Grand Hotel at Central World in Bangkok, Thailand on September 29-30, 2015. The event, supported by the Thailand Convention & Exhibition Bureau, was attended by 79 delegates from 60 organizations in 21 countries. The roundtable covered diverse topics that were aimed at promoting and facilitating the work of international associations such as good governance structure, budget planning, social responsibility, volunteering, secretariat management and communications. The workshop also provided sharing of experiences and networking opportunities. UIA http://www.uia.org/ is a research institute and documentation centre which is non-profit, apolitical, independent, and non-governmental in nature. The UIA has consultative status with ECOSOC and associate status with UNESCO.